as a conclusion to American Education Week activities. 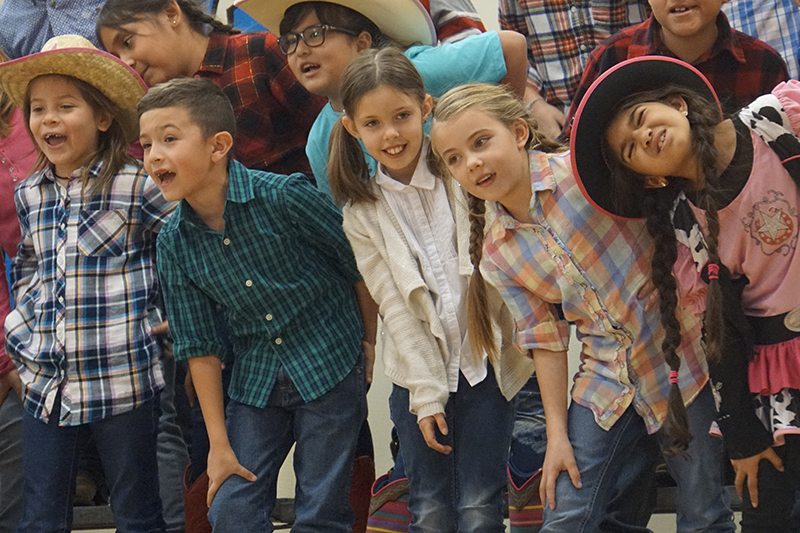 Coronado second-graders were "saddle sore" during their cowboy performance for AEW on Thursday. 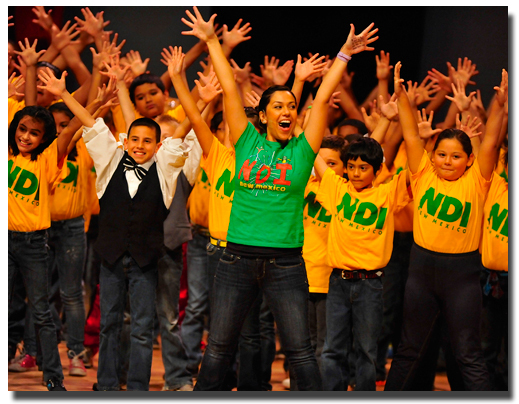 Edison fifth-graders were also on stage yesterday. Click on the photo for highlights. performance attended by parents and classmates. Click on the photo for highlights. American Education Week activities on Tuesday. following specialized instruction from Maciolek School of Dance. Click on the photo for highlights. 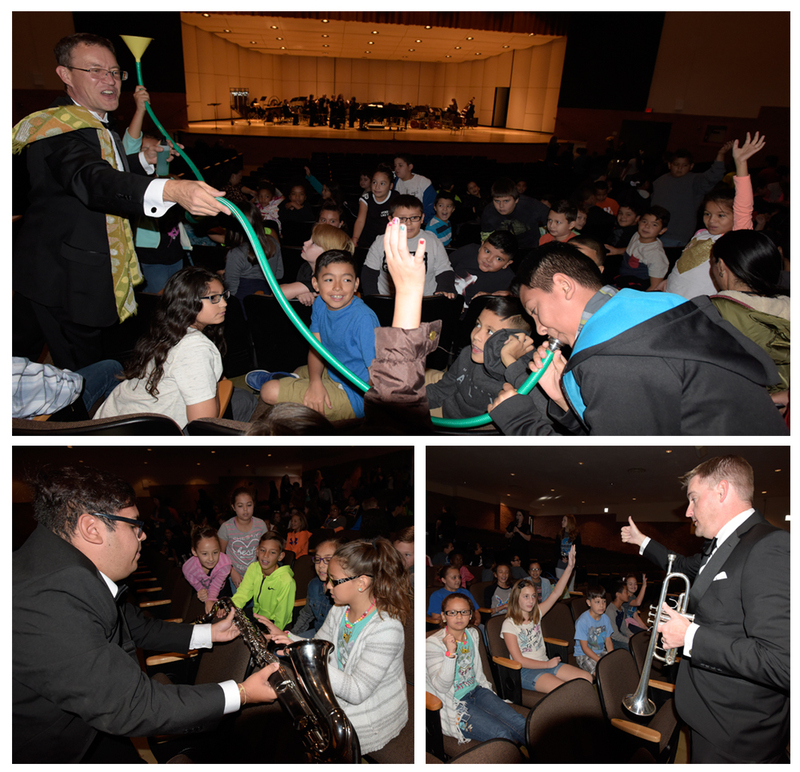 performed for Hobbs 4th and 5th graders on Tuesday morning at Tydings Auditorium. 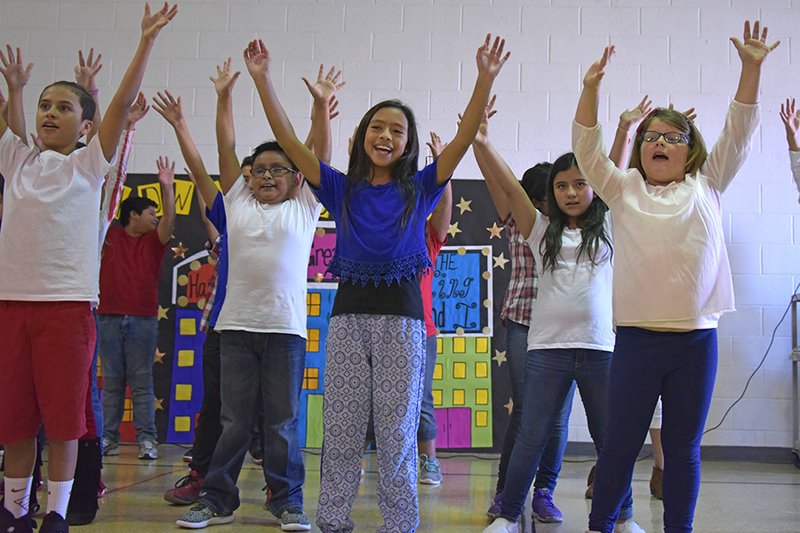 Taylor fifth-graders got a geography lesson as well as a chance to learn some rhythm when Maciolek School of Dance instructors spent a week teaching them dances reflective of other world cultures. 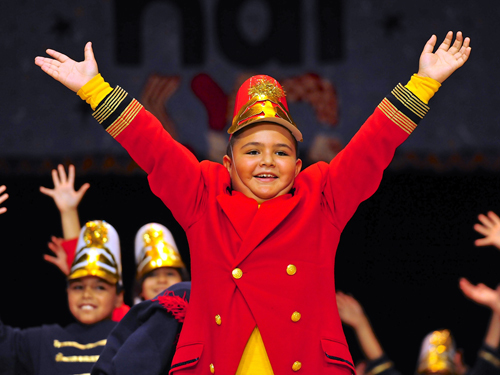 The result was a Friday morning performance for classmates and parents. Click on the photo for picture highlights. 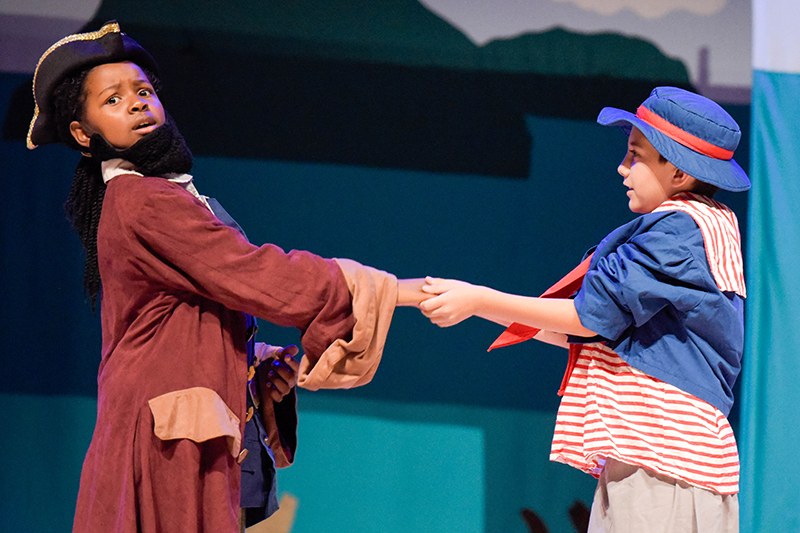 Students from Stone, Murray, Broadmoor and BTW performed "Blackbeard the Pirate" at Tydings Auditorium on Saturday. Click on the picture for photo highlights. 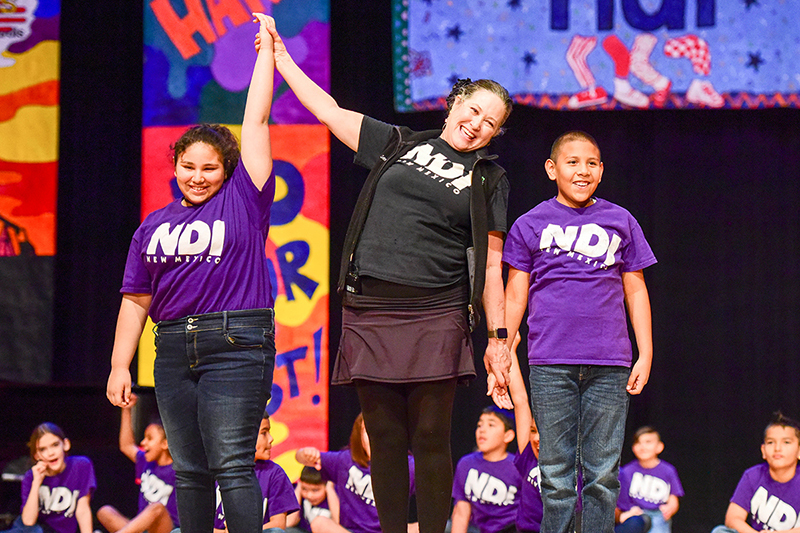 After a two-week workshop instructed by NDI teachers, Southern Heights, Coronado, Edison, and Will Rogers fourth-graders were on stage Friday for an energetic performance about math’s importance in daily life. They were joined by some BTW kindergartners. Click on the photo for picture highlights. The District Wide Art Show at the Lea Regional Medical Center was a smashing success. It had a live radio broadcast, and over 700 parents showed up to celebrate their art superstar's achievement. 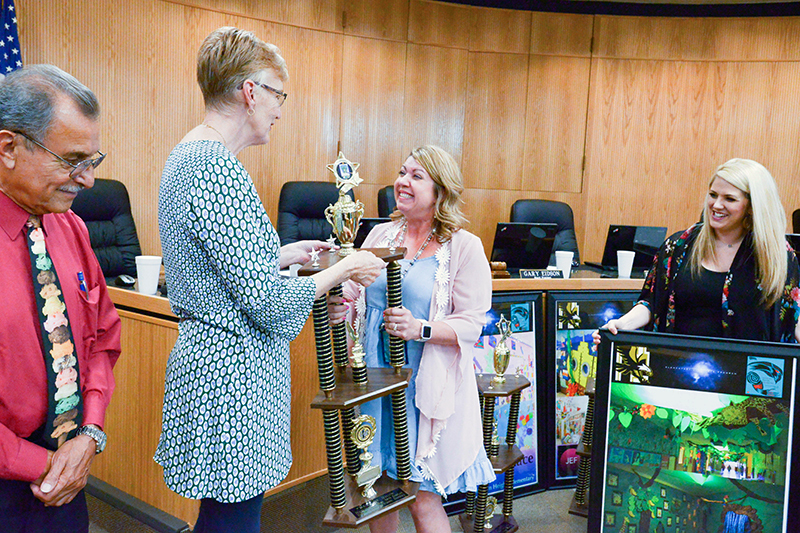 Taylor Elementary School Principal Lisa Richards accepted the District Art Show first-place trophy on behalf of her school during Tuesday's school board meeting. 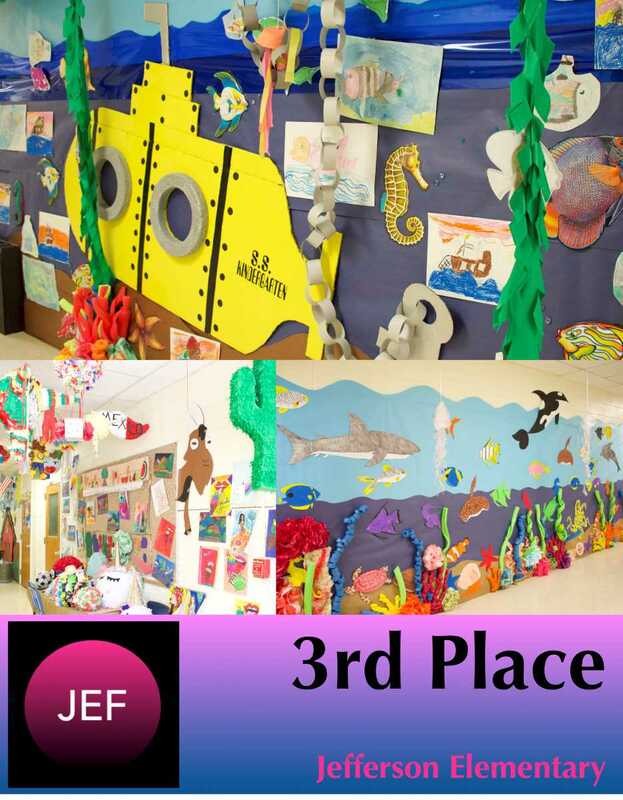 Southern Heights won second in the building theme contest while Jefferson was third. Stone 4th and 5th-graders enrolled in the after-school program displayed a variety of musical skills during a Wednesday afternoon concert. Congratulations to the FAEA Extended Day Programs at MUR and STO and 21st CCLC Extended School Day Programs at JEF and HOU. Click on the picture for highlights. 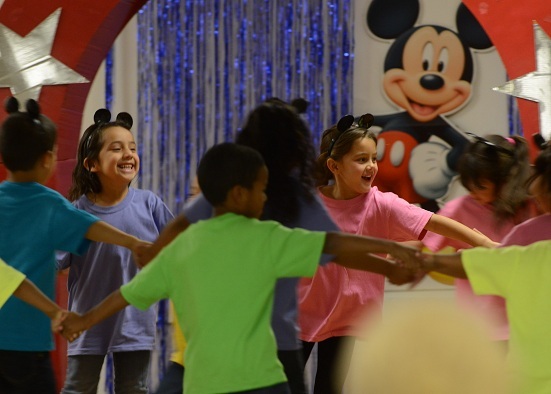 BTW students put on their dancing shoes Friday for a performance led by Maciolek School of Dance instructors. 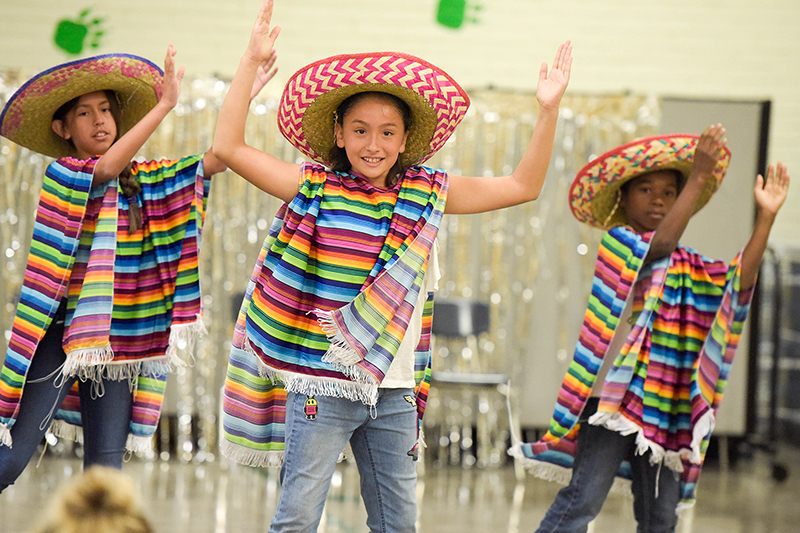 It was part of a week of dance instruction provided through the elementary arts program. 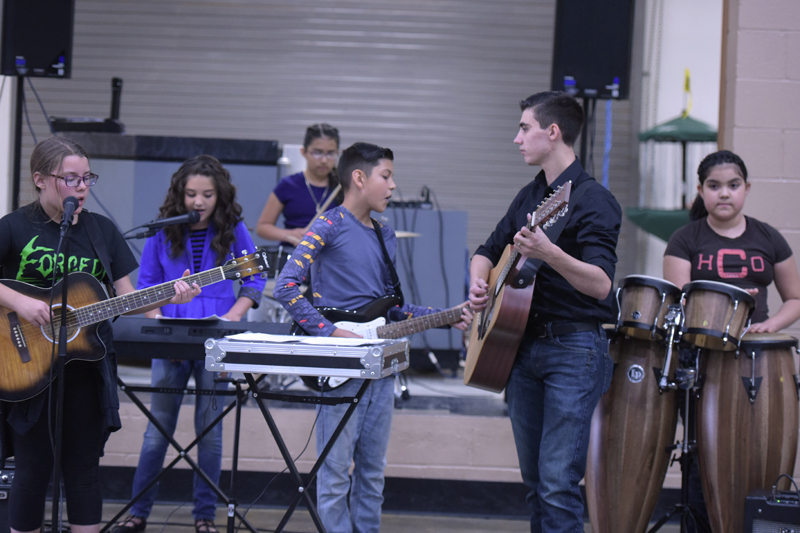 21st Century Community Learning Center students gave a rock-concert performance Saturday afternoon at the Teen Center. Click on the photo for highlights. 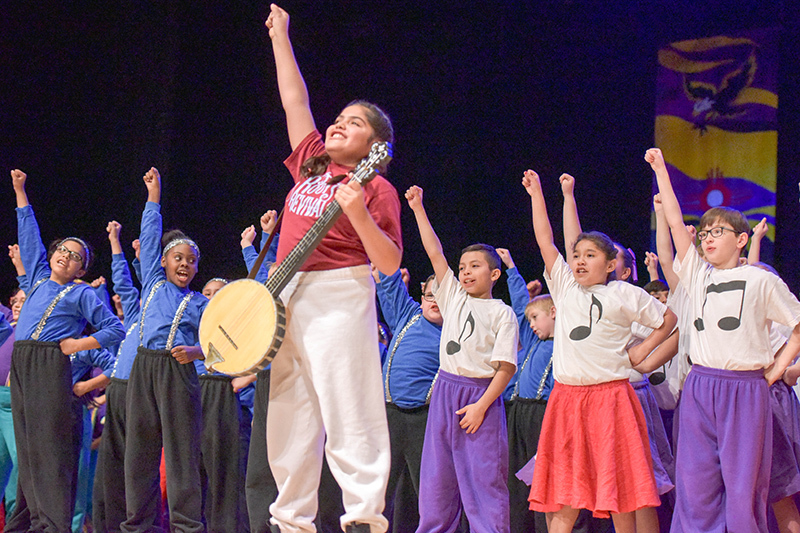 Taylor 21st Century students were on stage at Tydings Auditorium on Thursday night performing skills they've learned during after-school instruction in the art of flamenco dancing and guitar playing. Click on the photo for highlights. 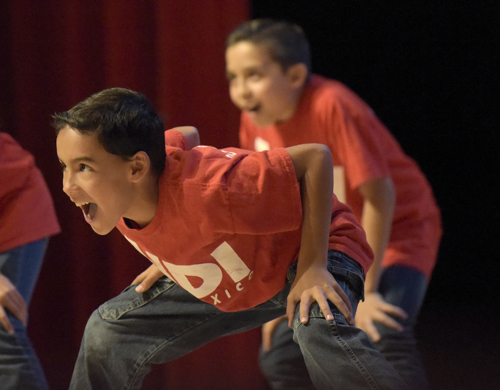 Mills, Stone and BTW students were on stage at Tydings Auditorium Friday demonstrating skills learned during a week spent with National Dance Institute instructors. Click on the photo for highlights. of a two-week workshop.Click on the photo for highlights. after spending a week working with Maciolek School of Dance instructors. Click on the photo for highlights. accompaniment during a guitar class. 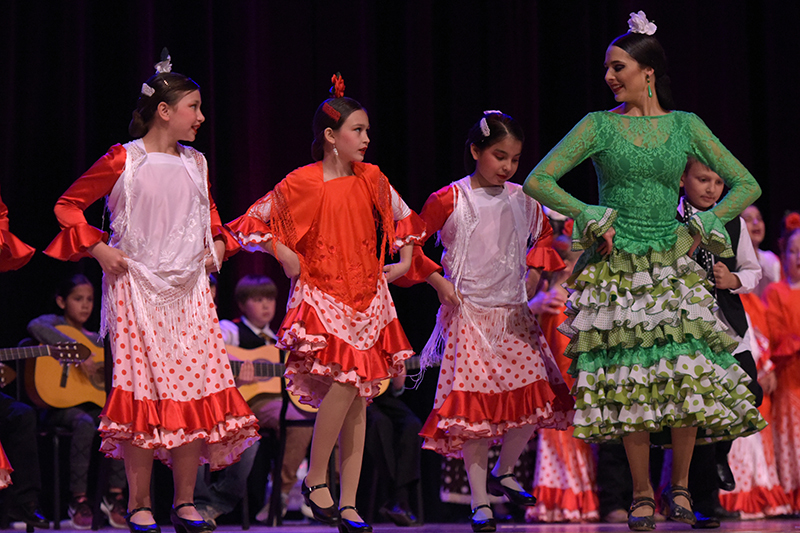 Students will give a Flamenco concert at 1:30 p.m. Dec. 8 at the school. the human body on Friday afternoon. Click on the photo for highlights. on Thursday with musical programs. Click on the photo for highlights. 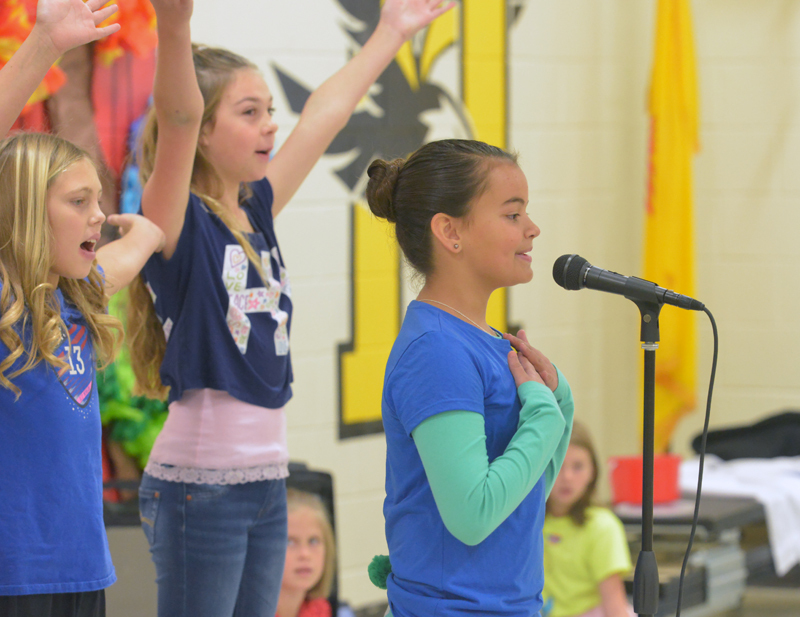 Will Rogers fifth-graders sang a cavalcade of Broadway hits for their American Education Week performance on Wednesday. Click on the photo for highlights. 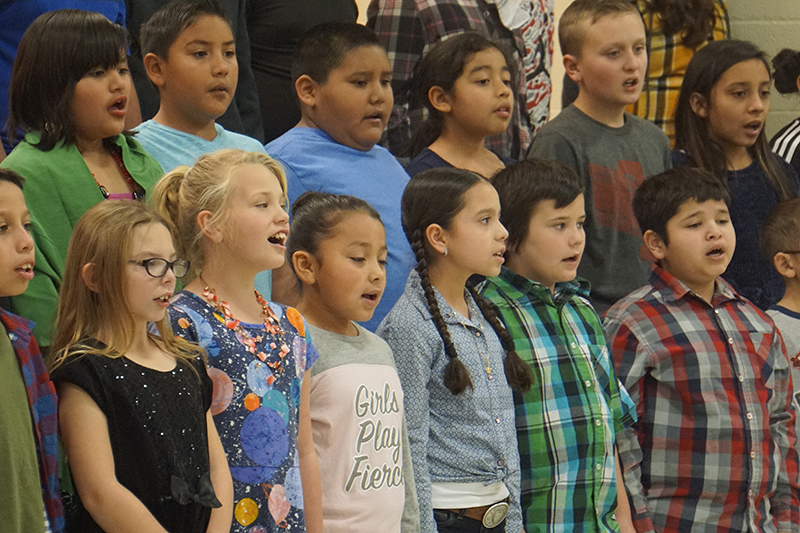 Stone and Southern Heights second-graders kicked off American Education Week on Monday with musical performances. Click on the photo for highlights. 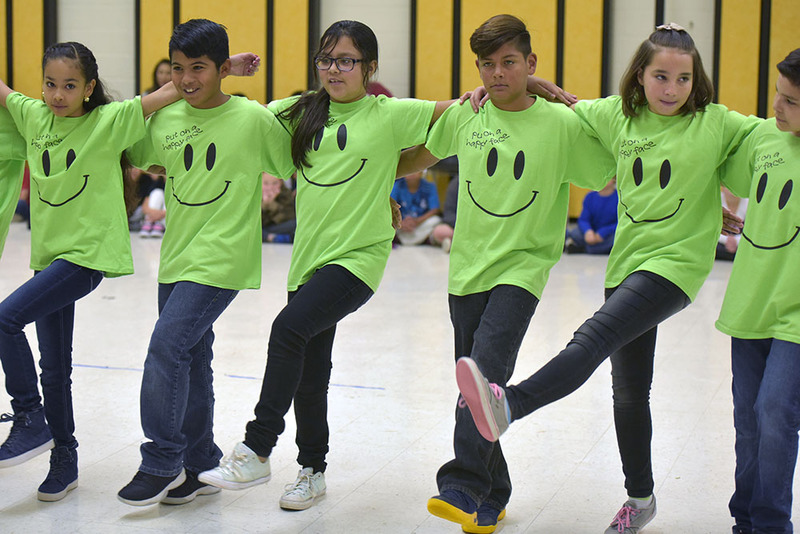 Jefferson fifth-graders performed dances to a "Put on a Happy Face" theme after spending a week learning moves from Maciolek School of Dance instructors. Click on the photo for highlights. theatre workshop. Click on the photo for highlights. 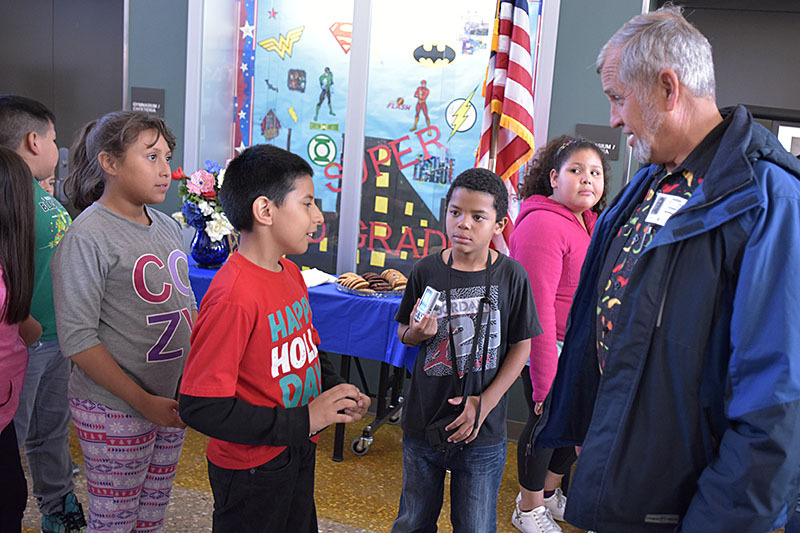 Murray Fine Arts Afterschool Program students, who held a Friday afternoon reception for veterans, line up to speak to and record the thoughts of Steve Brannan. The retired teacher served in the U.S. Air Force. On display were close-up photographs of serviceman uniforms produced by the students in the photography class. 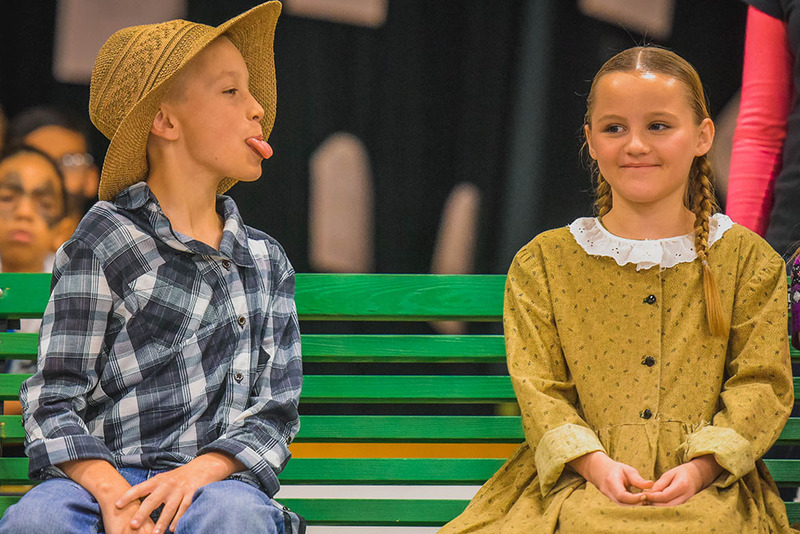 Taylor 5th-graders got a chance to relive history while also learning how to perform in front of an audience during a Friday presentation that was the result of a week-long workshop. Click on the photo for highlights. 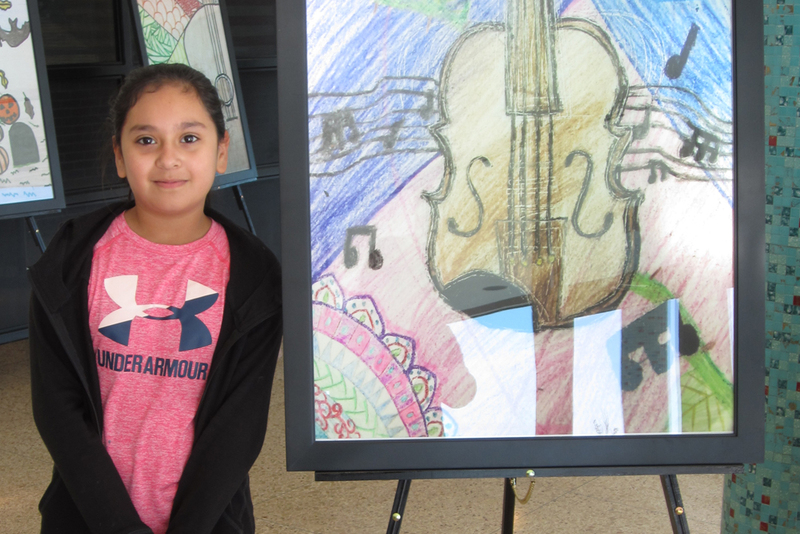 Taylor fourth-grader Yareli Tavarez was the Southwest Symphony districtwide art winner. Tavarez' drawing was picked tops in Hobbs and was displayed during recent SWS concerts at Tydings Auditorium. Check out the highlights from the event by clicking on the picture above. 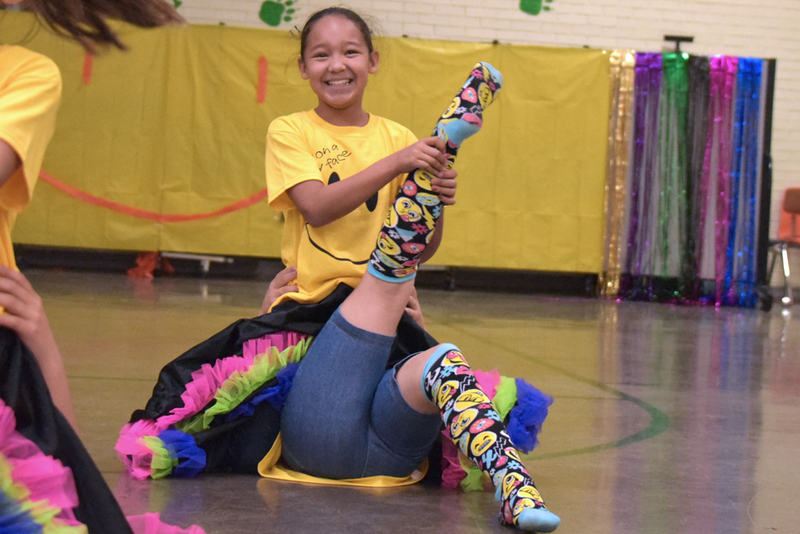 Heizer Middle School auditioned a group of superstar ballet dancers who will attend dance class on Wednesdays afternoons this year at Expressions Dance Academy. 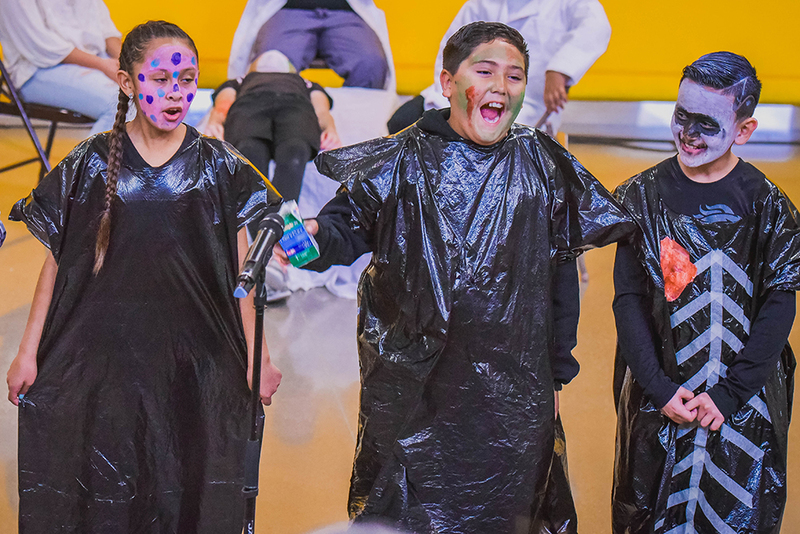 Taylor 5th graders put on a happy face as well as a dance performance on Friday after getting instruction from Maciolek School of Dance instructors all week. Click on the photo for highlights. 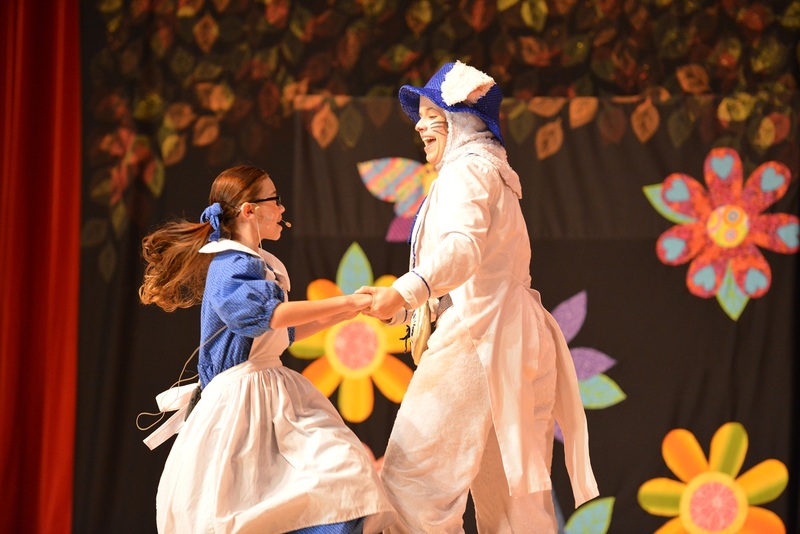 The Alice in Wonderland cast from Broadmoor, Murray, Stone and Booker T. Washington did an amazing job last Saturday at Tydings Auditorium. The full performance videos is on our new YouTube channel than you can watch by clicking on the picture above. 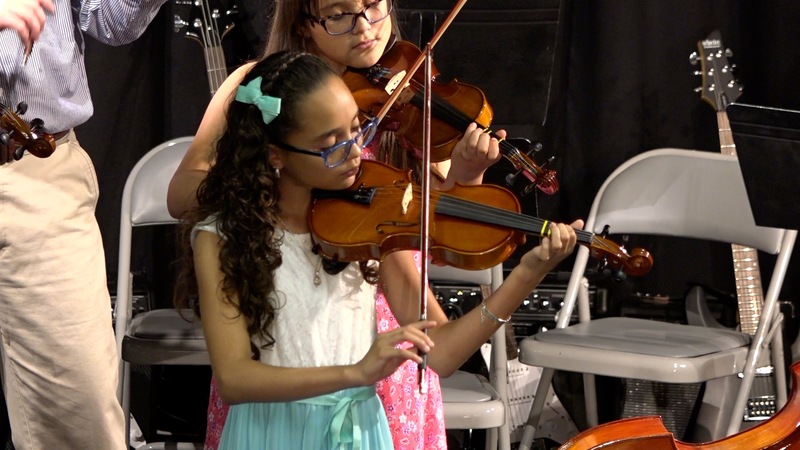 We had a very successful 21st CCLC Strings Camp Concert at HMS Little Theater this summer. Check out the highlights by clicking on the picture above. 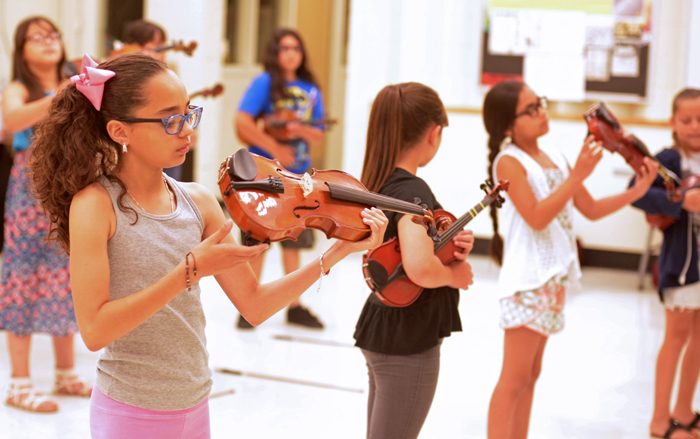 Around 30 students showed up at Tydings Auditorium to attend a Strings Camp. They are exploring different genres of the Musical Strings World. There is a Family Event for the Strings Camp coming up at 1:00 pm on June 30th at the HS Little Theater. Amazing Photos by Kate Russell of 21st CCLC HIL, TAY, Teen Center & MEOW WOLF Artists. Click on the picture above. The Fine Arts Advisory Committee met a group of their new friends in the 21st CCLC Program. They studied some data about the two programs and then did a team building activity. Click on the picture for the presentation. 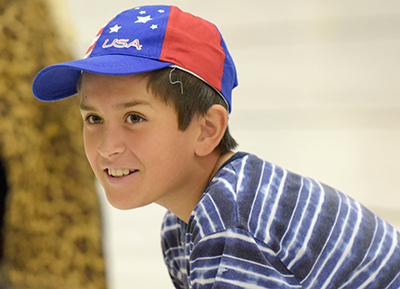 More than two dozen Hobbs Middle School students learned from older classmates Saturday as Hobbs High School hosted "Dramacom." HHS theatre students led a series of day-long workshops in which they demonstrated dance, comedic improv, stage combat and a series of other acting techniques. 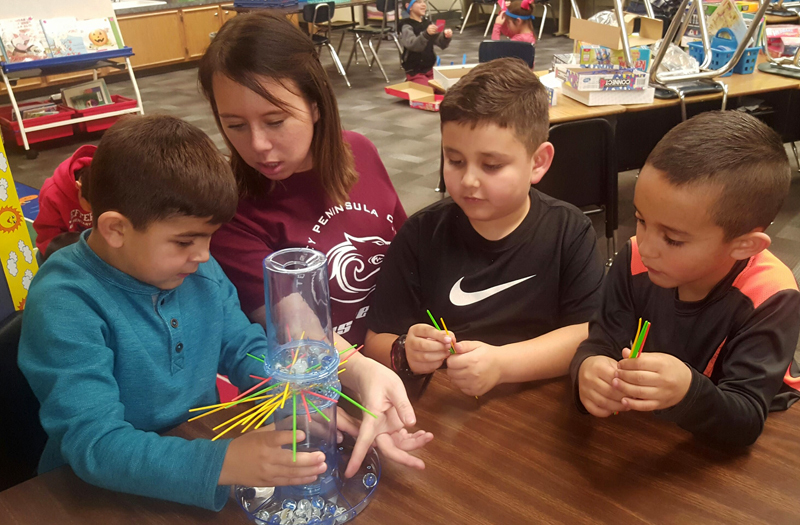 Jefferson teacher Brittany Murray helps students involved in the school's after-school classes test their brains in a battle of Kerplunk. 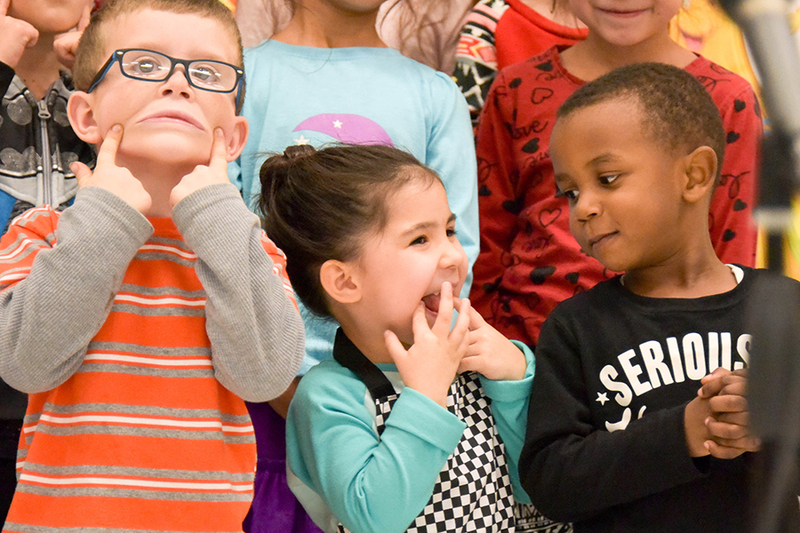 Jefferson expanded its 21st century grant program to 16 classes this semester and are getting students involved in activities that include - among other things - cooking, reading, engineering, music, science, art sculpture and sewing. Click here for the Presentation at the 2017 FAEA Winter Conference. "A true champion can adapt to anything." - Floyd Mayweather, Jr. The ability to adjust to each level of innovation creates great programs in education not overnight… but overtime. Nobody ever enjoys being part ofprogress, but they are necessary in big projects. These projects which grow from the “skunkworks” level and are scaled to an established size. Thisis where the program begins to impact large groups of students at a high level. It all depends on the stakeholders asking the right questions like “What’s Next?” Welcome to the frontier of educational leadership. Looking at survey data, impact on student grades, and reflecting on the logistics of the program the past six months is where we begin the process ofour Spring Action Plan. If we do our job, the growth of the program in the coming months and years will develop more fractal like the plant in mydad’s IBM Selectric and less like a hard template inflexible and thus incapable of growing big. The one thing I have learned living in Hobbs, New Mexico for almost ten years is this community is incapable of doing small things. When theycommit to a project, it is a big project. The 21st CCLC Program passed the 850 mark in registrations and is climbing this month. We haven’t evenstarted the registrations for the Summer Camps yet which will be a new wave of students. We had hundreds of students, parents, teachers and community attend another FAEA Event G-Squared Performance on Friday. 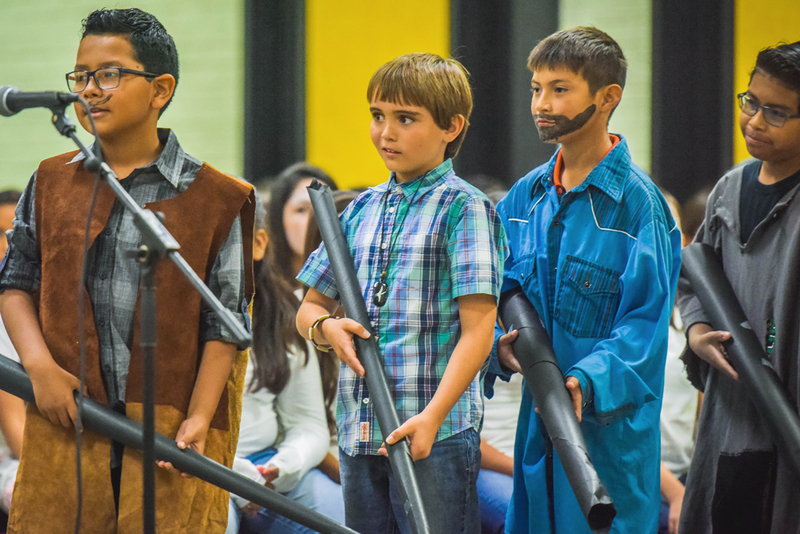 The students at Broadmoor Elementary 5th Grade Class came together to present a play. Click on the above picture for the full performance. 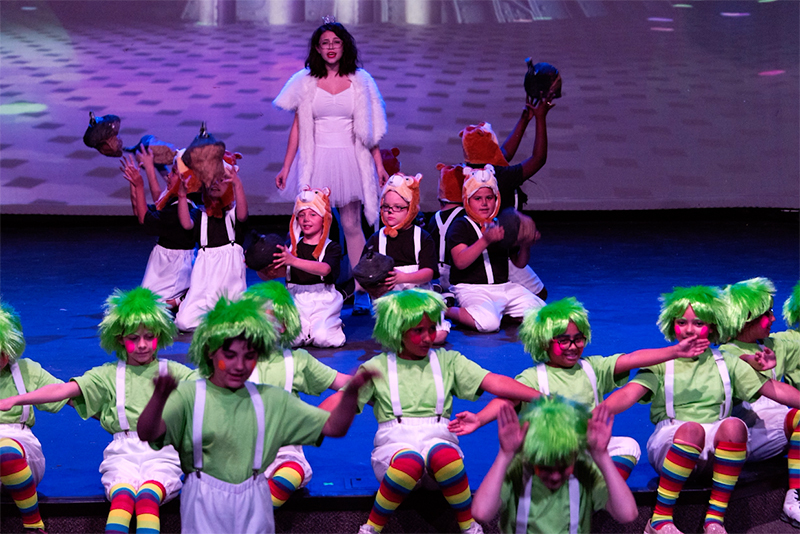 Emily Stuard was one of several College Lane fifth-graders who had solo parts in Friday morning's performance of Seussical. 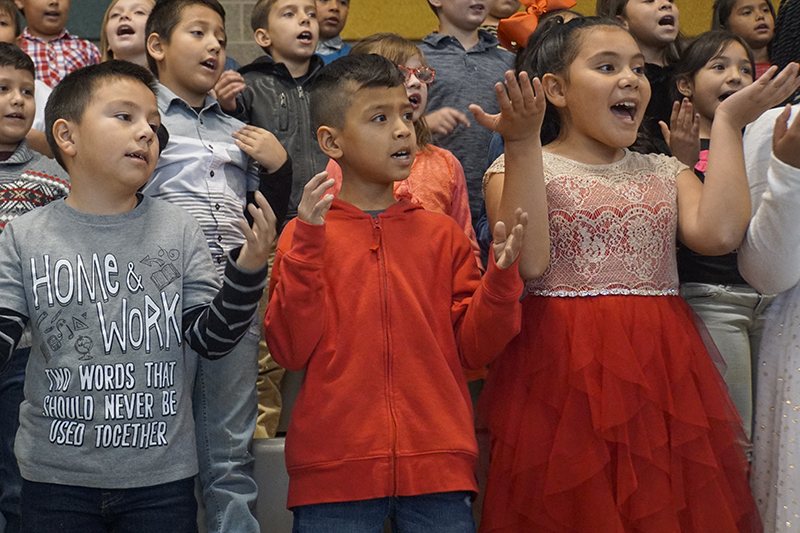 Several other elementary schools also gave musical performances for their parents over the past two days as part of American Education Week activities. 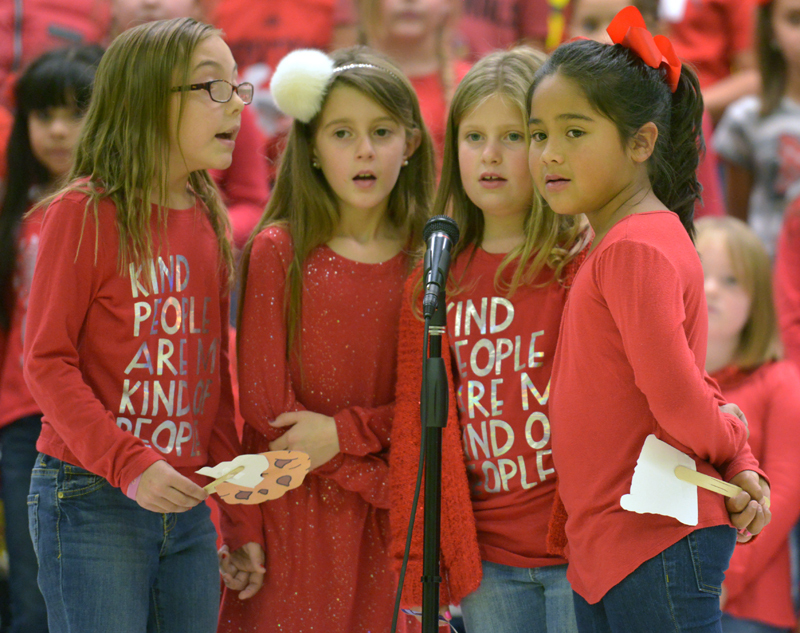 Sanger second-graders sang about how to be a friend rather than a bully on Tuesday. 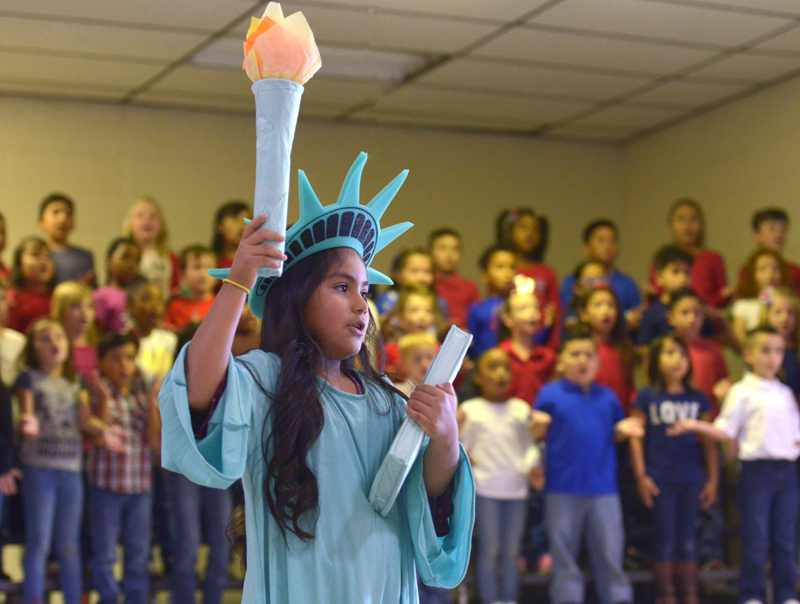 In addition to Sanger, students from Stone, Will Rogers, Mills, Southern Heights and Murray Elementary School have given performances during the first two days of American Education Week. 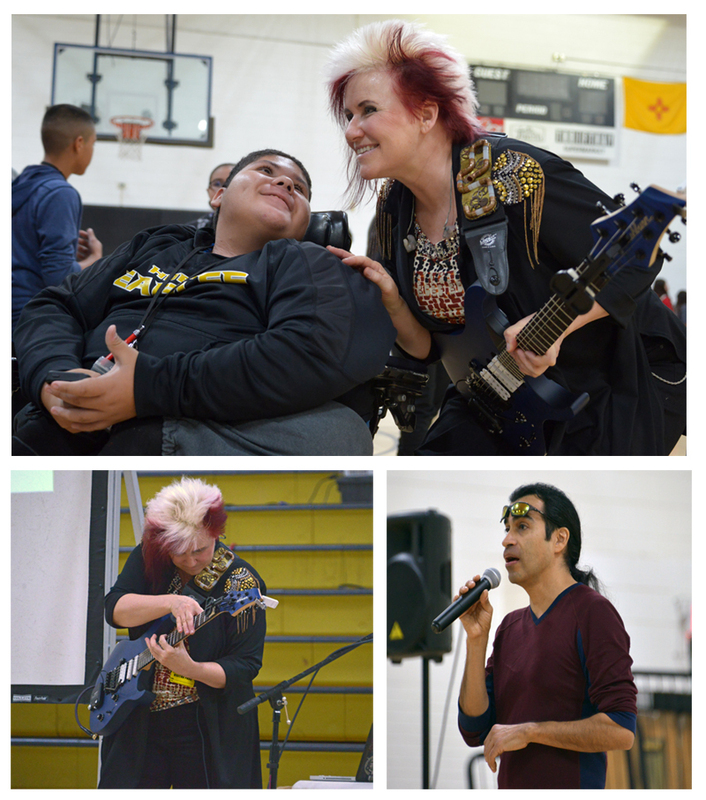 Heizer Middle School students (including Jesus Gonzalez), enjoyed a one-person concert performed on Wednesday morning by Jennifer Batten, lead guitarist for three of Michael Jackson's World Tours. 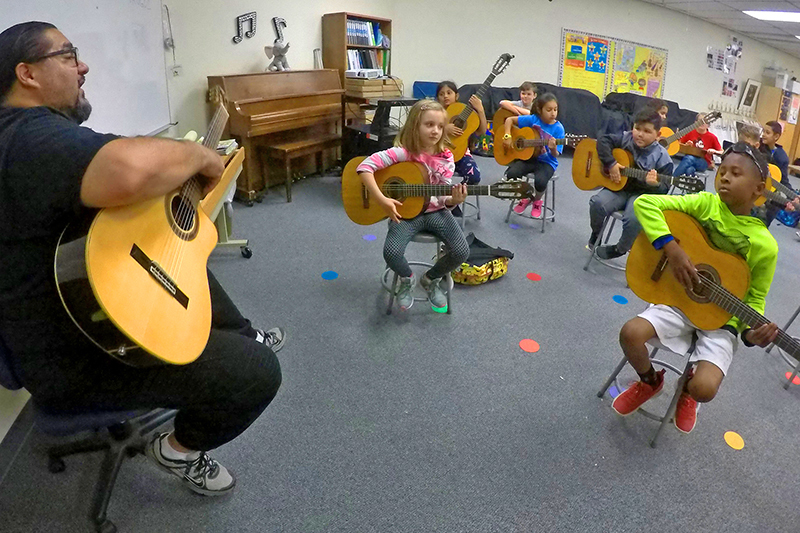 Batten's connection to Hobbs is music teacher Arnold Cardon, who received guitar lessons from Batten and invited her to town to share her talent and stories with Heizer, HHS and Southern Heights students. Cardon and Batten will perform a free concert at 7 p.m. Thursday at Tydings Auditorium. 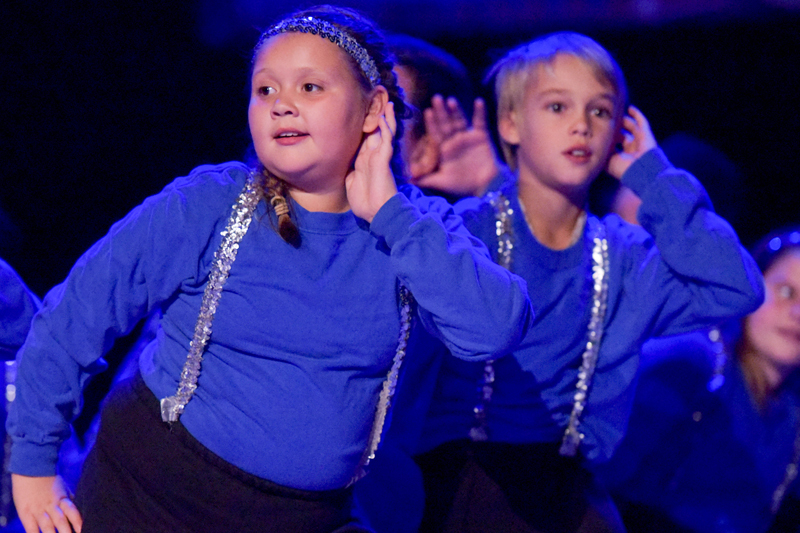 Stone and Mills fourth-graders were on stage Friday giving a display of new skills learned during a National Dance Institute Residency at their schools. Click on the picture for photo highlights. 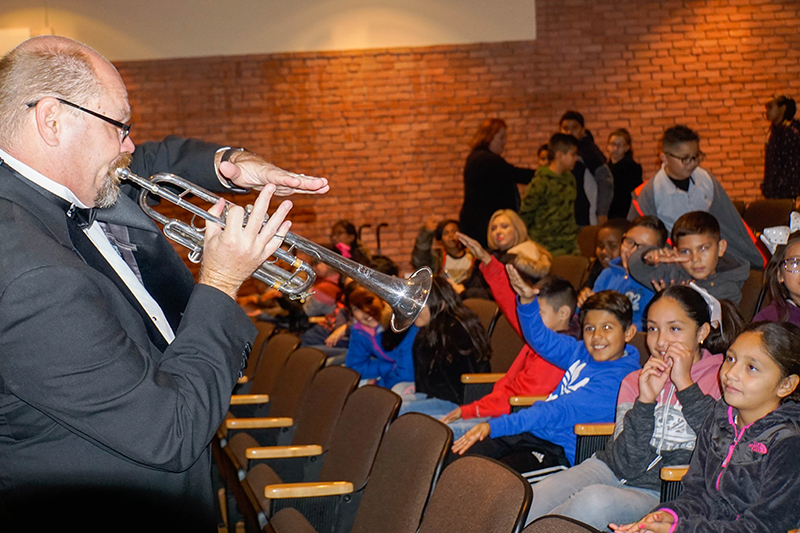 Hobbs fourth-graders got a chance to hear and handle musical instruments prior to Tuesday morning's field trip to a Southwest Symphony concert performance at Tydings Auditorium. Musicians who shared their knowledge included Ted Hale from Phoenix (top), who demonstrated the properties of amplification with a hose, ENMU's Herman Montoya (left), who let students examine his bass clarinet and trumpet player Ben Fairfield, also from ENMU. We had over 600 students, parents, teachers and community attend another FAEA Event Maciolek School of Dance Performance on Friday. The students at Stone 5th Grade Class came together to present "Another Opening Another Show". Click on the above picture for the full performance. 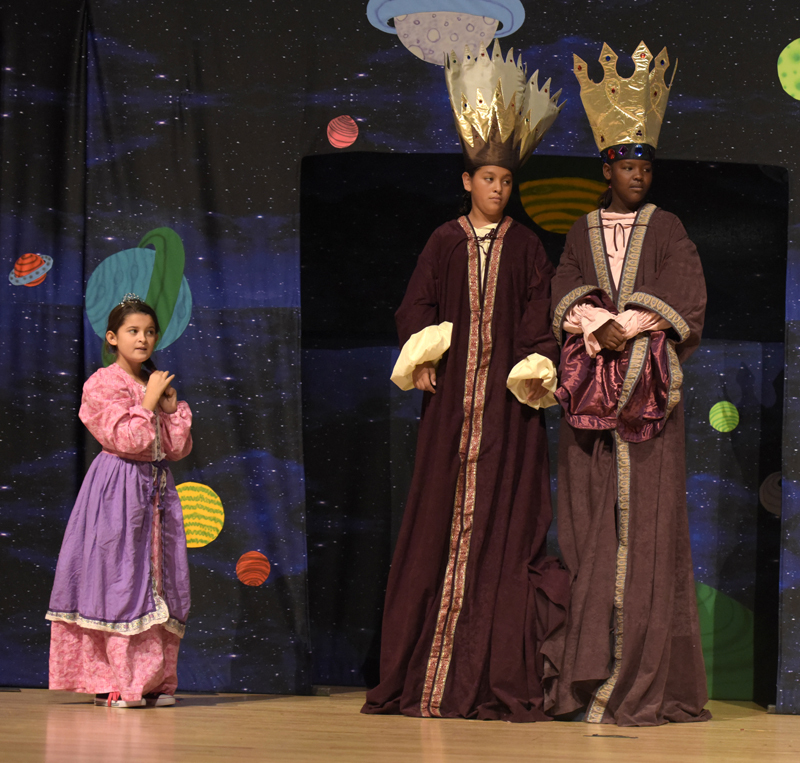 New Mexico's Youth Art Month continues in Hobbs with MCT's "Princess and the Pea". Another successful FAEA Event performed by the Stone, Murray, Broadmoor and Booker T. Washington students. 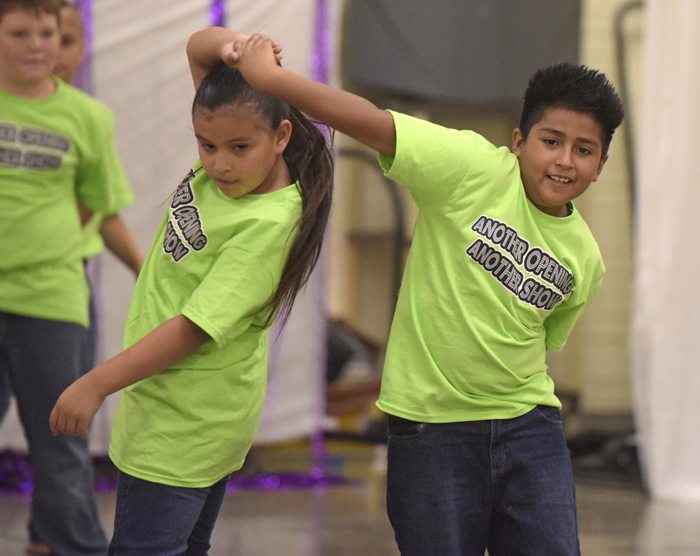 Taylor fifth-graders Aleigha Muro and Mathew Garza show some of the spiffy moves they learned during a week-long dance residency conducted by Maciolek School of Dance instructors. 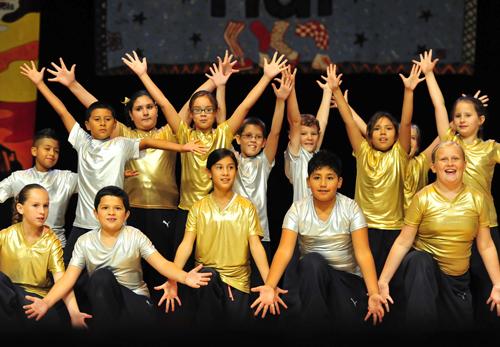 The students performed a musical dance program - Another Opening, Another Show - for parents and classmates on Friday. Click on the photo for highlights. Judy Abney and her husband went up to Albuquerque and hung the top 60 pieces from the Hobbs Municipal Schools at the New Mexico State Fair. 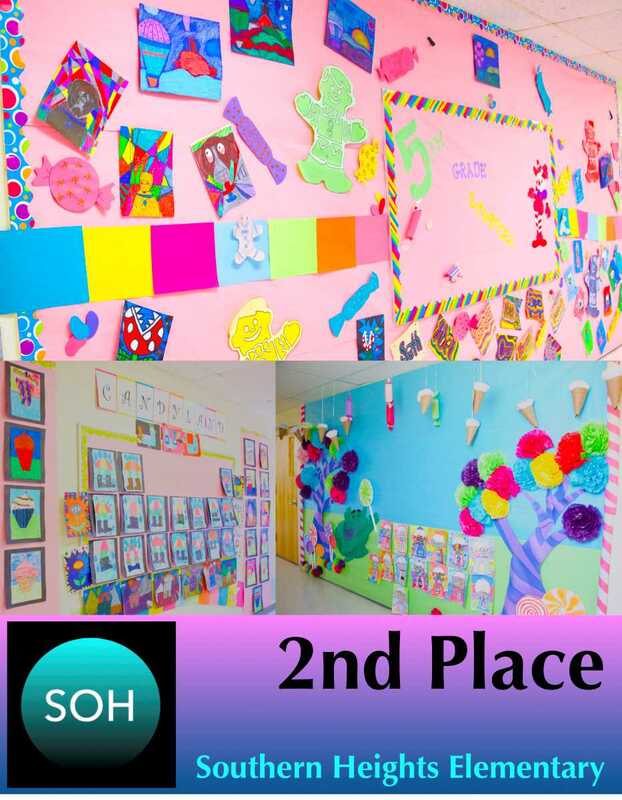 These top elementary school art work masterpieces will be back in Hobbs just in time for the Medical Arts Plaza Exhibit Reception at the end of the month. 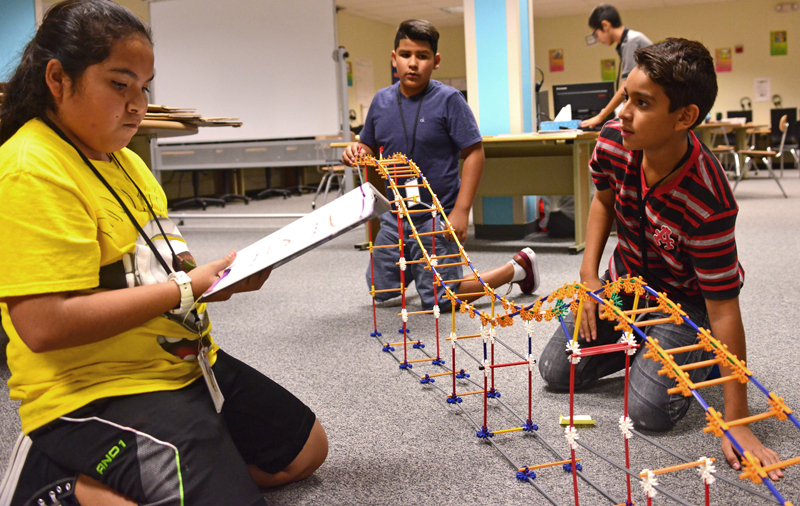 Hobbs students are staying busy with after-school enrichment activities - including using engineering skills to build roller coasters - thanks to a 21st CCLC and FAEA grants that teams schools with community partners. For a look at this week's wide variety of activities at four HMS schools, Expressions Dance Academy, the Hobbs Teen Center and Center for the Arts, click on the photo. 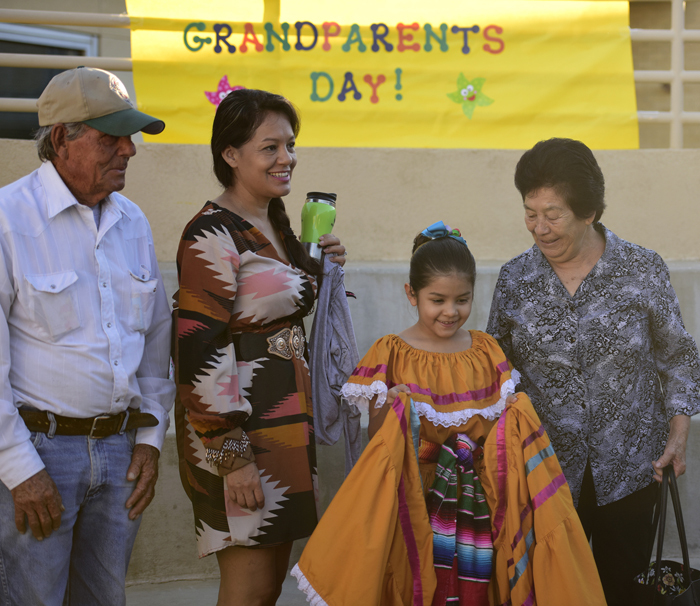 Southern Heights students celebrated Grandparents Day on Friday morning by serving up doughnuts and a helping of Folklorico dancing. Click on the photo above for highlights. 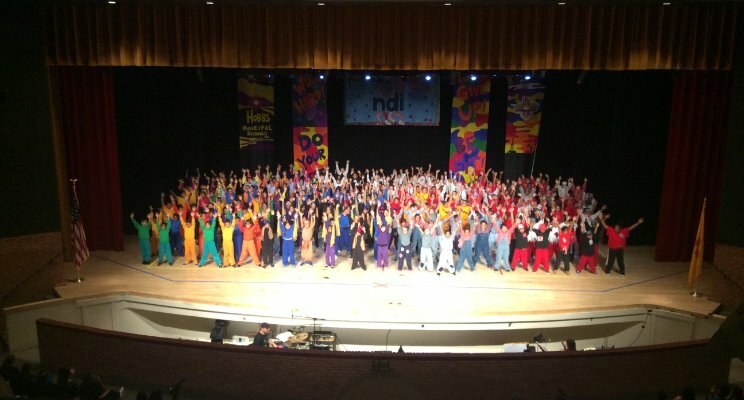 Students from Will Rogers, Coronado, Southern Heights, Edison and BTW were on stage at Tydings Auditorium Friday for this year's first National Dance Institute performance. 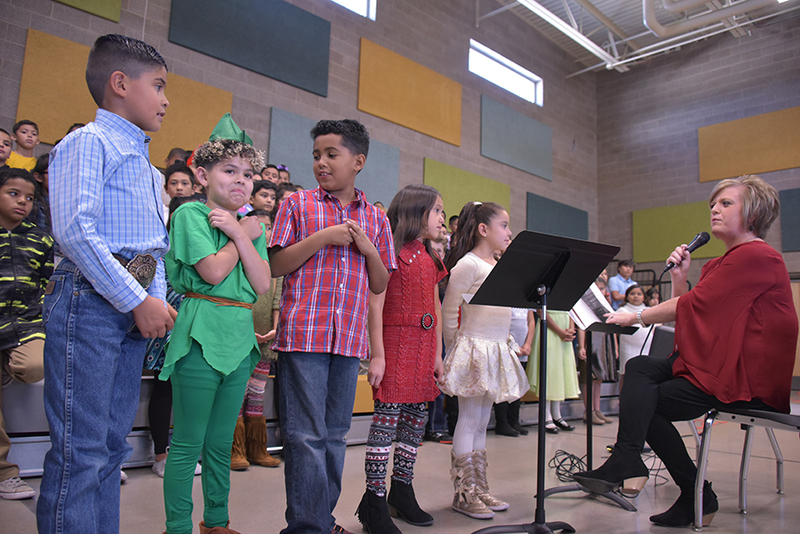 The district's remaining elementary schools will get their chance to perform with the Santa Fe company later in the school year. Click on the picture above for photo highlights. In Mrs. Hartly’s 2nd Grade Class, I routinely sat at my desk diligently getting my school work done so I could get to the “enrichment” activity which was usually a blank box in the middle of an 8 1/2 X11 worksheet. This was where I could draw about what we were learning about that day. I always enjoyed trying to draw from the illustrations of the books we were reading. The lined sketches from Dr. Seuss were some of my favorite picture references. I could identify each line in the picture and accurately draw it on my paper. One day our class was reading a Dr. Seuss book called “The Snitches”. This was a story where half the Sneetches had a green star on their belly and half of them did not. They both thought their group was superior to the other and even constructed a “Star-On” and later a “Star-Off” machine just to remain different. In the end, they realized that it did not matter if they had a green star on their belly or not; they were all equal. Looking back, Mrs. Hartly could have preached to us for many days about equality and tolerance; but there was something about an collection of words and pictures that made a lasting impression more than 30 years later. As I entered middle school and high school, my photographic memory sharpened from sketching many hours a day for many years. I could even memorize an entire score of music on the piano. However, I had trouble sight reading music and I was assigned books which began to have less and less pictures in them. Reading was a chore because we later learned, I was a slow reader. Reading slowly was like watching a movie in slow motion... it was boring. This was in a time before the world-wide web, so my parents purchased an old-school floppy disk with a reading exercise on it. We inserted it into our family’s beige IBM PC at home and I practiced following a dot, then a word, then a sentence from left to right everyday until my eyes gained speed enough to read at a comfortable pace. Reading at a normal speed allowed me to picked up Michael Shaara’s novel about Gettysburg. It allowed me to camp out on the high rocks of Little Round Top and follow a school teacher from Maine, Joshua Chamberlain, down the hill with nothing but bayonets and swords and help save the Union. This story taught me that whatever problems in life, there was someone on a muggy hightop in Pennsylvania with no ammunition left and he figured it out. We all have challenges in different ways and in the words of C.S. Lewis, we are not alone. 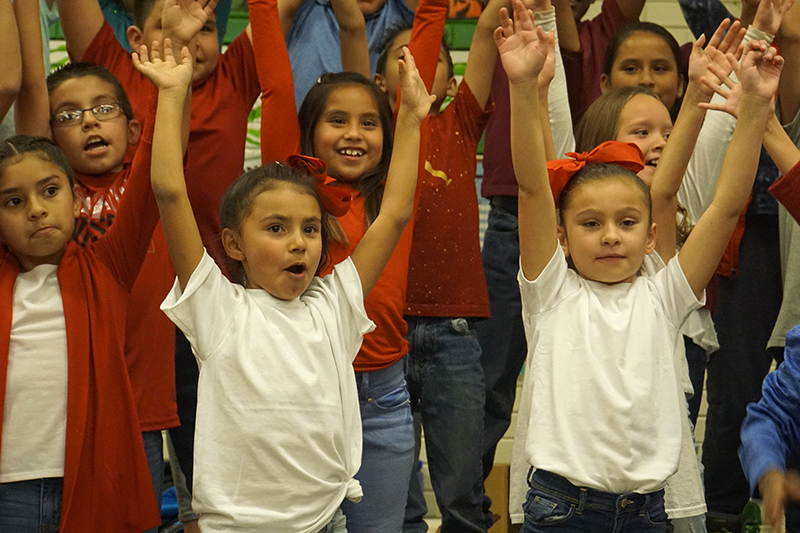 Hannah and Carmen and their team from NDI-New Mexico brought this joy of reading to Hobbs, New Mexico this week. They taught that reading a story well told mixed with the “Core Four” of working hard, doing your best, never giving up and staying healthy will help these students strive for a life of excellence. Some students might even become a professional writer or artist when they grow up and share their story with the world. 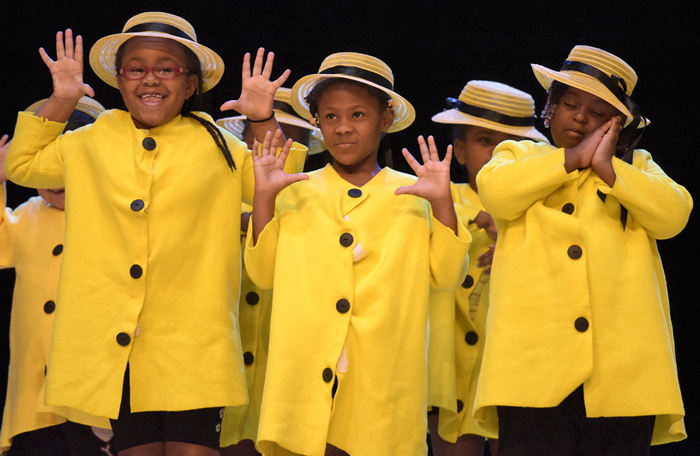 Thank you for supporting the arts and kids. The Fine Arts Advisory Committee for Hobbs Municipal Schools met in May for their annual meeting. 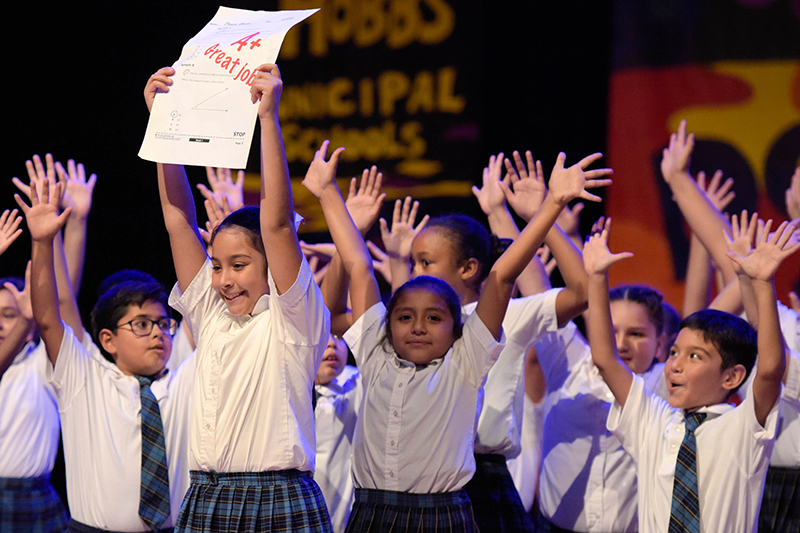 They answered two survey questions about what constitutes a quality fine arts teacher and where do they see Hobbs Municipal Schools' Fine Arts Program in 2020. Their answers are in the word clouds above. Elementary Fine Arts Coordinator Tyson Ledgerwood outlines details of a federal grant during Tuesday's school board meeting. 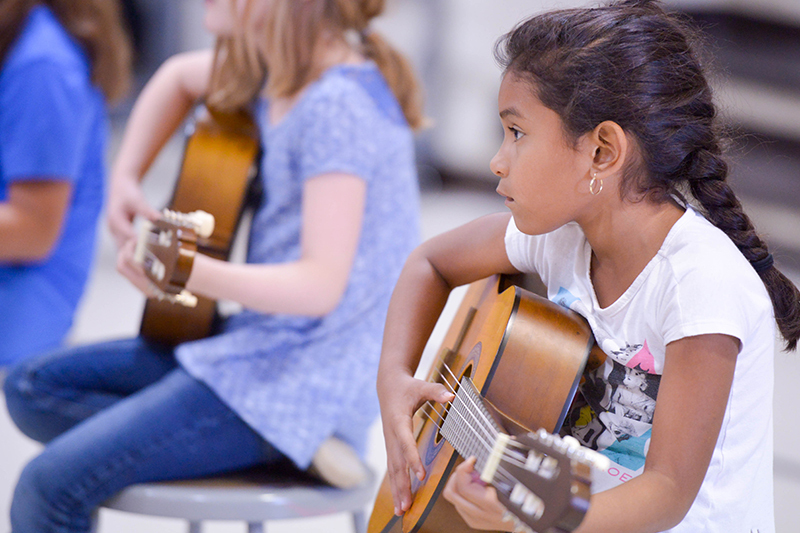 The grant was awarded to HMS and community partners last week and will finance nearly $5 million in activities ranging from music instruction to parenting techniques over the next four years. 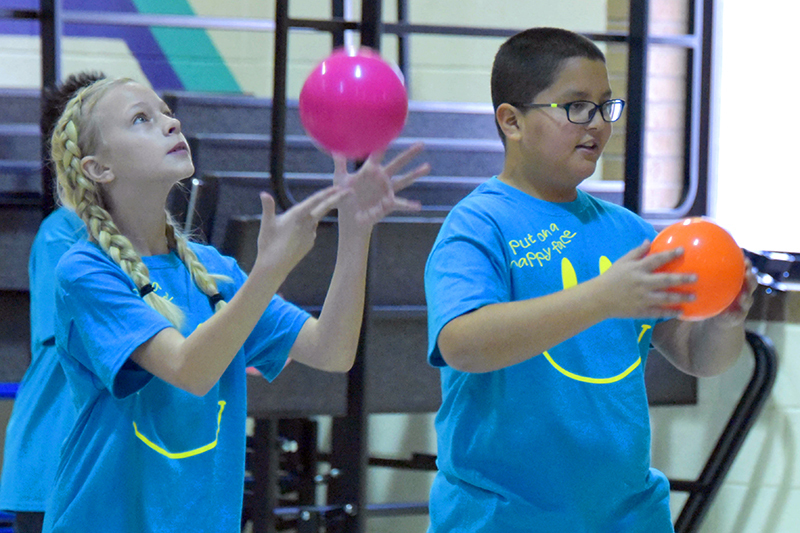 Programs will be offered at the Hobbs Teen Center, Boys and Girls Club, Center for the Arts and HMS elementary and middle schools and will impact hundreds of students. 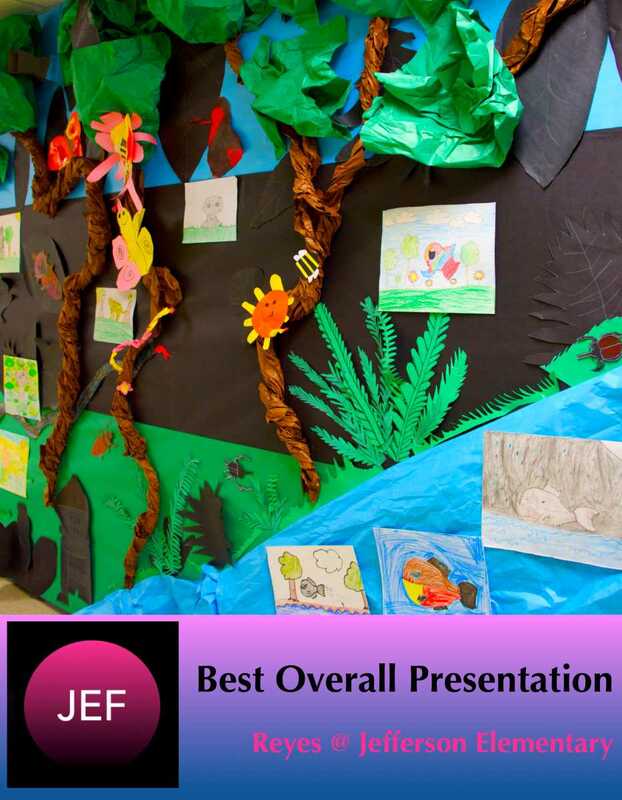 Click on the picture of the presentation for the program design. Click on the KZOR link to listen to the Media Meeting about the District Wide Art Show Exhibit Series and 21st CCLC Program Launch. 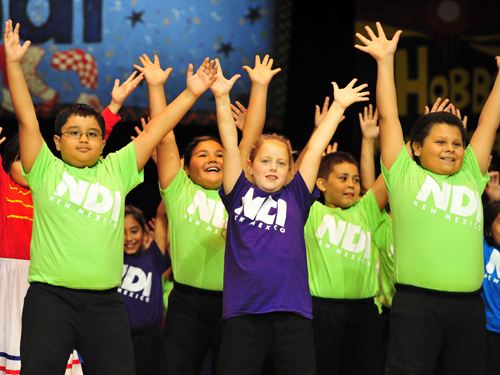 Take a look at some classic NDI-New Mexico clips from years past performed by Hobbs Municipal SchoolsElementary Students by clicking on the picture below. 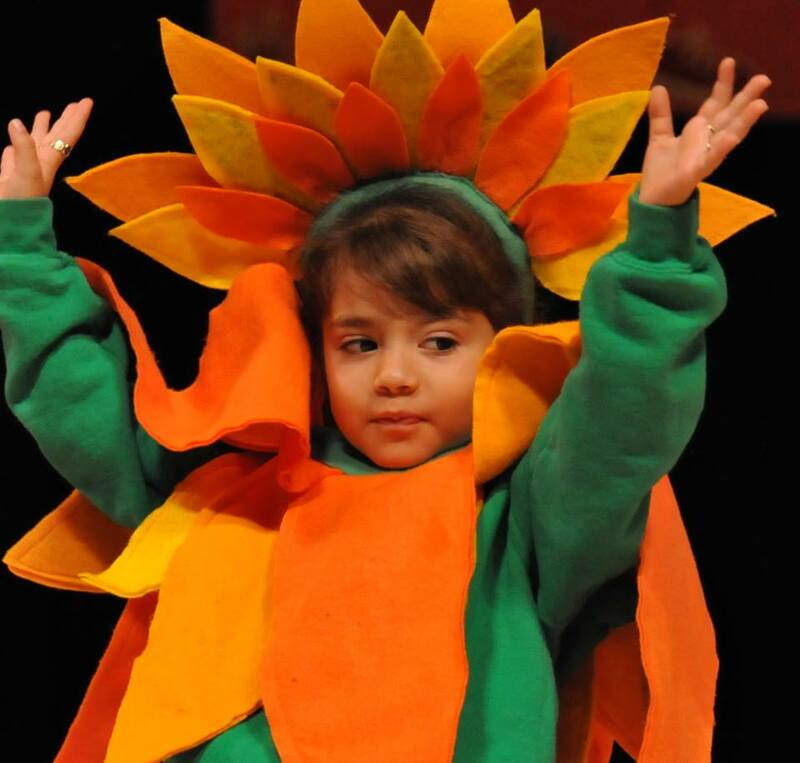 Click on the Sunflower Picture above for the full length video of the NDI-NM evening performance. Click on the Dancer Picture above for the full length video of the Broadway Bound! evening performances. 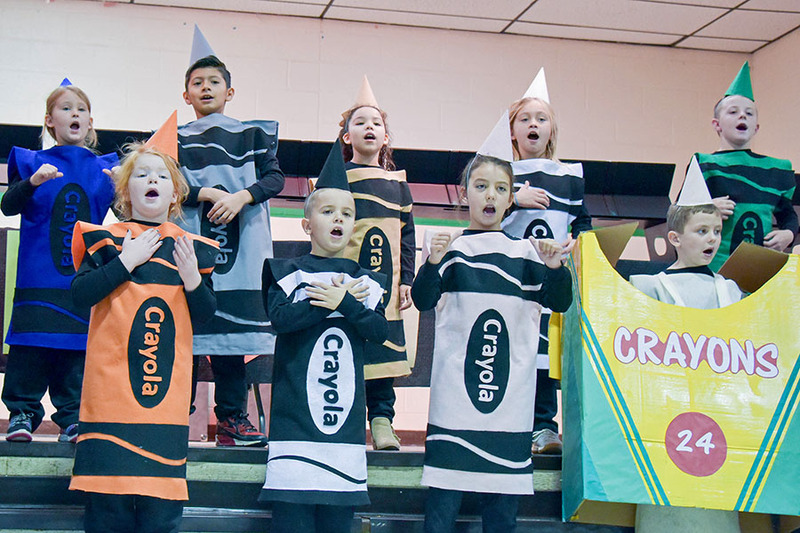 Here are some highlights of the talented staff at Hobbs Municipal Schools whose job is to teach Art and Music Instruction to the elementary schools.